I snapped this photo at Incheon airport as I was waiting for my flight. Airports are such emotional spaces, don't you think? Happiness, homecoming, sadness, separation are thick in the air. More photos from my first b&w roll to follow soon! It's a blog where Sheri and Shari post interviews with creative people twice a month, complete with beautiful photos. I just read the latest issue featuring Tara O'Brady and I'm gonna slowly work my way backwards through the issues. Can't wait to discover more lovely people & their work! yea trix. i loved that photo most. 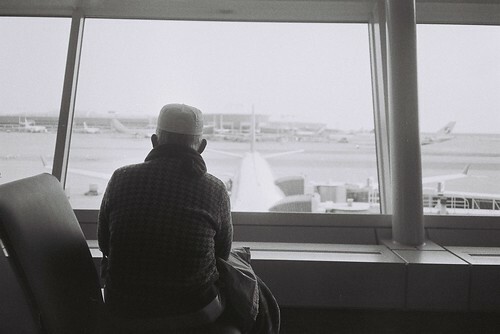 i was thinking - maybe the old man was thinking about his family, or maybe he's thinking that there was a time he never thought he'd see the world like that, with giant malls and airports, and planes zooming around everywhere. once i was walking in plaza sing second level, pushing past crowds of people and saw a little old man just standing by the railing and looking at the mall. he was watching the people below, looking up at the shops and around him. i realised he probably never expected that as a little boy. @elissa: I never thought about that, I thought maybe he just missed home. You're probably right! I love this photo Trix! And I love the thoughts you and Elissa have shared. I adore airports and don't mind stopovers in my travels as it is a great time to take in human nature, emotions and inspiration. It's fun to try imagine what each person's story is. Thanks so much! I love airports too. It would be really cool to just roam around, talk to each person and find out their story.